Go Green for the Holidays! Wendy Story of Story Garden & Rooftop Design is here to give you some simple tips to make your holiday green, aromatic and sparkling this season. 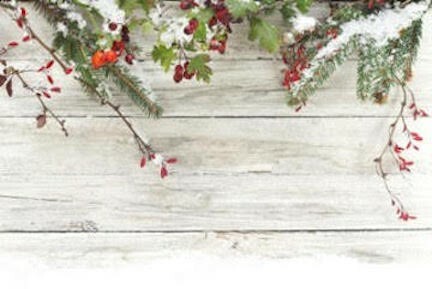 This a special edition of our quarterly gardening blog to help you get through the holidays! “With so much to organize- food, gifts, cards, decorations, trees and flowers- the run up to the holidays can be crazy,” says Wendy. Here are Wendy’s tips for how to simplify your holiday decorating. Hang just one large wreath on your door as a feature. 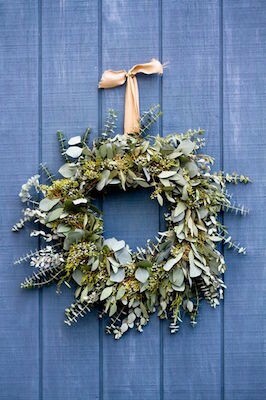 Try a beautiful deep green inviting wreath made up of fragrant greens such as eucalyptus, pine and rosemary. The farmers market at Grand Army Plaza has an amazing collection of evergreens to purchase. Greens, which stay fresh for longer, include scotch pine (P. sylvestris), balsam fir (Abies balsamea), fraser fir (A. fraser) and boxwood (Buxus). If you want a modern touch, mix in a few copper sprayed foliage pieces and seed heads for a design that looks rich and festive. Add sparkle with LED battery operated fairy lights on your wreath. You can, of course, always go fake so it lasts even longer! Crate and Barrel has some great options this season. 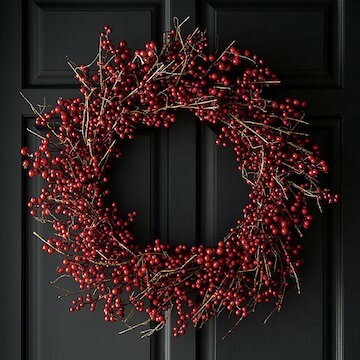 “ I particularly like their red berry wreath, which would look great on an entrance door or over a mantle,” says Wendy. Beautify the holiday dining table with fresh flowers and mini fir trees. “You don’t need armfuls of flowers or foliage for striking arrangements,” says Wendy. Snip foliage from your garden, or if you intend to have one, the base of your Christmas tree, or even scrounge bits from the sellers at the sides of the streets who always have loads of discarded pieces. Then just add a few single flower stems for a simple display. Fill your home with seasonal plants and bulbs in wonderful winter whites; hyacinth, cyclamen or orchids will all work well. “Did you know the Greeks and Romans were among the first to bring evergreen boughs indoors in winter?” says Wendy. To them it symbolized nature and the promise of spring when the earth would be fresh and leafy again. To keep the promise of spring alive in your house create lovely aromas by bundling up scented herbs and foliage. Secure them with a band and ribbon and fix them to door handles or a bannister. Garlands look fabulous draped both inside and outside your home or apartment building. They are easy to make with lengths of pine boughs you can buy from your local Christmas tree seller or farmers market. Attach ribbons to the boughs at intervals and tie on berries, pieces of holly and mistletoe using floristry wire. Wrap them around the bannister indoors or outside on railings and secure. 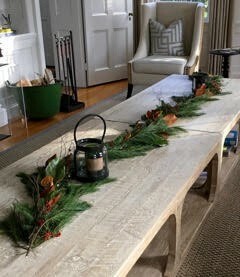 Garlands can also be used on your dining table, over your fireplace, in fact anywhere in your home! Don’t forget about the outside containers on your deck, patio, balcony or garden! Add a dash of color! Keep those evergreen plants in place and create unifying displays using just one variety of plant. 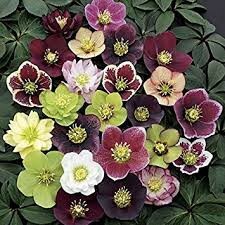 Cyclamen, heathers, hellebores and pansies look great when planted in mass in your containers . Stick to one color and one variety for maximum impact. A cluster of silver foliage plants can also look amazing. Take a look out of your back or front windows. What part of the garden/containers do you see in the winter from your main viewing point? Focus some interest in those areas with either a twig/outdoor lighting or a fun sculpture hanging from a tree. ‘Plant’ a magical LED lit tree on your balcony/deck or in a corner of the garden or hang festive string lights to bring a different look at this time of year. Have the lights on a timer so they come on each evening without you having to remember. Restoration Hardware has an amazing array of holiday lights to choose from. “I particularly love these Northern Globe String Lights in gold which can be used indoors or out”, says Wendy, “they illuminate ornamental trees beautifully or can be used as shown here adding sparkle to a garland”. This is the holiday special from our quarterly city gardening features from Wendy, come back soon to see how to survive the depths of winter and be ready for spring!!! 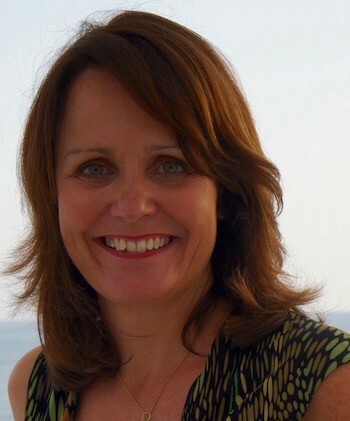 **This article written by Katriona Kearney and Debi Pine. New Office, Same Exceptional Service! July 16, 2018 While we have grown our thriving brokerage business, from scratch, without even having a retail presence, we are trying something new.